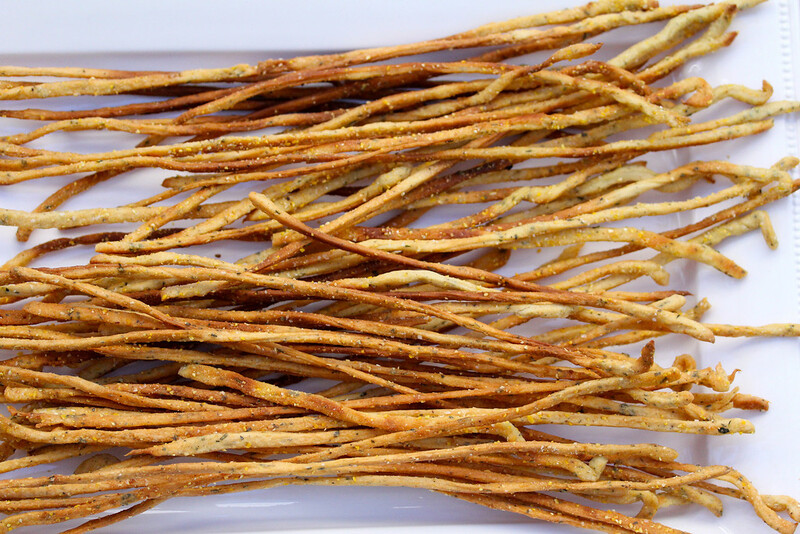 These super skinny and crispy pieces of straw colored goodness are completely addicting. The ingredient list includes parmesan, black pepper, white pepper, garlic, chives, rosemary, thyme, sage, and oregano. My biggest issue with them is that I can't leave them alone. They are crazy good. Don't you think these would look fabulous at your cocktail party? I promise you, they will be gone in about 15 minutes. The first time I made these, I did not thoroughly read the recipe, and half way through, realized that it called for a pasta maker, which I did not have. I made do with a rolling pin and a pizza cutter. They were good, but the crisping stage took quite a while longer, and the thicker ones were a little too hard. The next day I ordered a Pasta Maker ... Why not? Am I the only person who buys a pasta maker just to make breadsticks? Someday I'll attempt pasta... In the meantime, I'd like to pause and admire my breadstick making toy (the mess is corn meal, more about that later). Check out these super skinny pieces of dough created by running the dough through the machine. It's your call as to what herbs you add to this dough. We have a little "farm" of herbs in pots so I went out and grabbed a handful of rosemary, thyme, oregano, sage, and chives and chopped them up together and added them to the dough. This recipe is adapted from Rose Levy Beranbaum's The Bread Bible published in 2003. This was the first recipe I made from this book. The book has an extensive instructional section on all things bread, including developing your own recipes, and, of course, equipment. 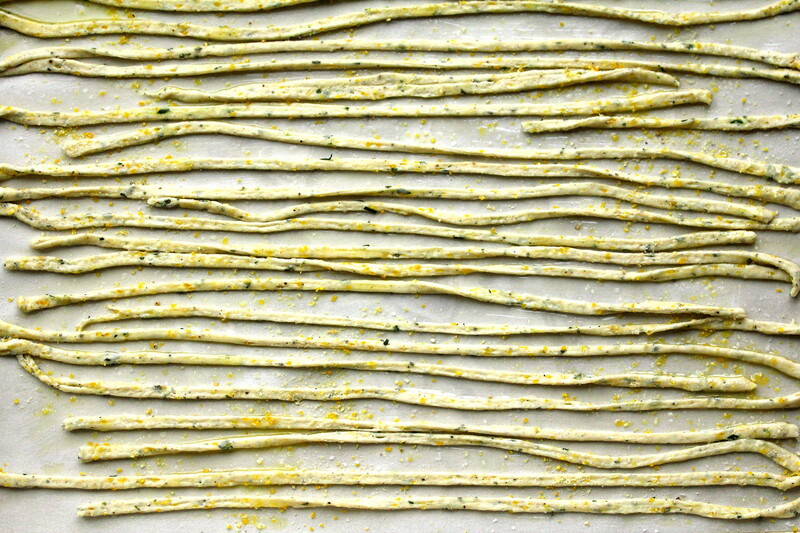 The dough is made 6 to 12 hours in advance of making the grissini, so plan for that extra time. I made my dough the night before, and cut and baked the breadsticks the next morning. In the bowl of a stand mixer, whisk the flour, yeast, salt, peppers, garlic powder, parmesan, herbs, and Tabasco. Place the dough in an oiled bowl or dough rising bucket, spray with spray oil, cover with plastic wrap, and place in the refrigerator for 6 to 12 hours. After an hour or two, if the dough has risen, push it back down. Mine did not rise at all. After 6 to 12 hours, preheat the oven to 375 degrees F, place a rack in the middle of the oven, line two baking sheets (I use two so I can prepare the next baking sheet while the first is in the oven) with parchment, and sprinkle them with corn meal. Place three of the pieces back in the refrigerator (covered) and flatten the piece you kept out on a counter sprinkled with corn meal. 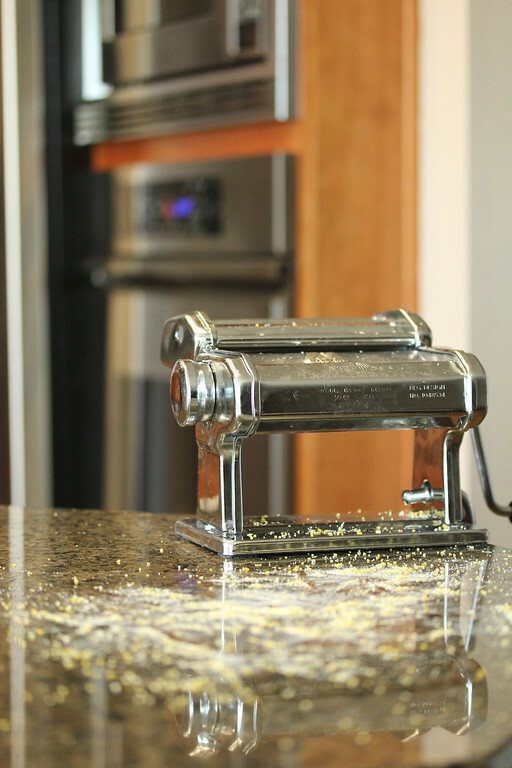 Run the dough through the fettuccine cutter of the pasta machine and toss the noodles in cornmeal (thus the mess in the photo above). Separate the strands and place them lengthwise on the baking sheet. Do not stretch the strands. If they are too long, trim them to fit the pan. Bake for 12 to 16 minutes until golden and the ends slightly lift up. Do not allow to get too dark. While the first sheet is baking, begin preparing the second batch. Repeat with the next three dough pieces. There is no need to replace the parchment. Once all of the dough is baked, turn off the oven, and place the wire racks in the baking sheets. Place the sheets back in the oven and allow the breadsticks to crisp for about an hour. I turned my oven to 100 degrees F with the convection mode on for the last 15 minutes. Hi Dipti! It's kind of lengthy, but easier than you might think once you get the hang of it. You can do two sheets at a time, but I like to do one at a time. I guess you could compare it to baking cookies one sheet at a time. I love these - they're so beautiful! I want to devour those photos. I do stuff like that, too (buy a certain tool for one reason) - you'll end up getting plenty of use out of it, I'm sure. I've had a pasta maker on my "list" for ages. Hmmm...maybe giving these grissini a try by hand will push me to the brink ;P.
Actually, if you keep them in an airtight container, they last a few days. I had to break them in half to store them though because I don't have an 18 inch container. Something new I "need." 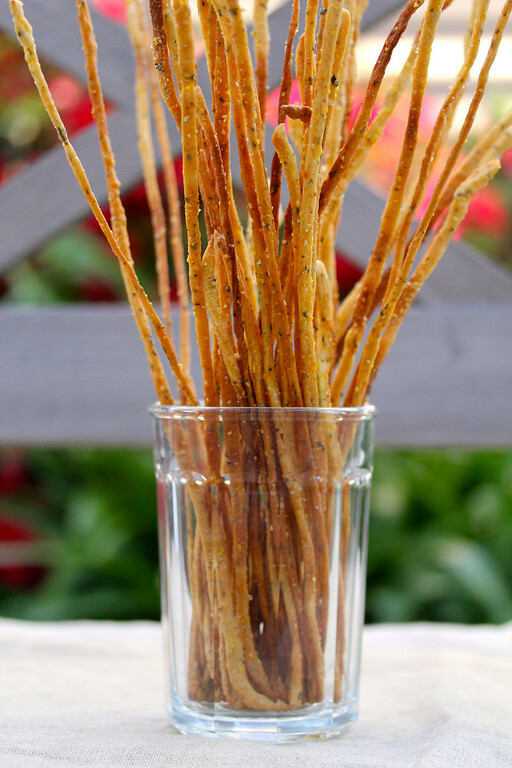 I never think to make these and I love crispy bread sticks! I am so excited! I stupidly thought, how would I cut these? A pasta maker is brilliant. My little one loves to make pasta. She is going to be so excited to add these to her repertoire. These look so fantastic! 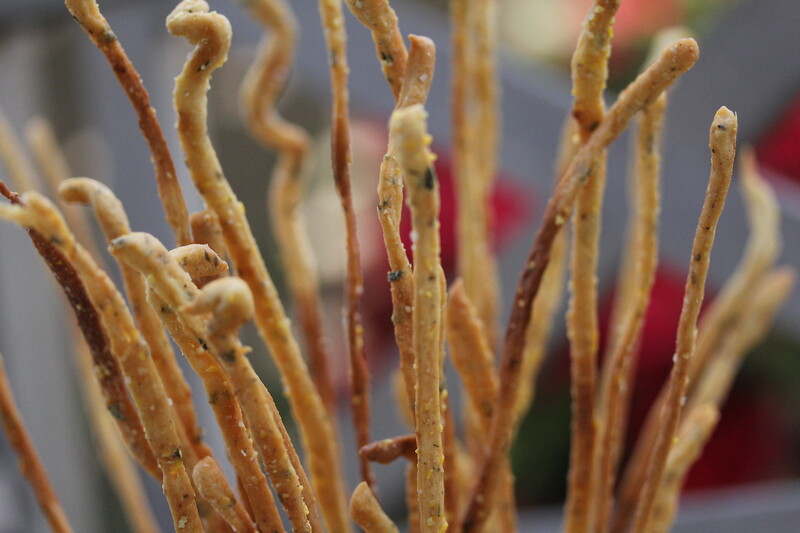 I've never made grissini but reeeeeeally want to now! Thank you! I have only used my pasta maker for bread sticks. I keep intending to use it for pasta but it hasn't happened yet.